Rain . . . and more, MUCH MORE, more often, on the way . . . 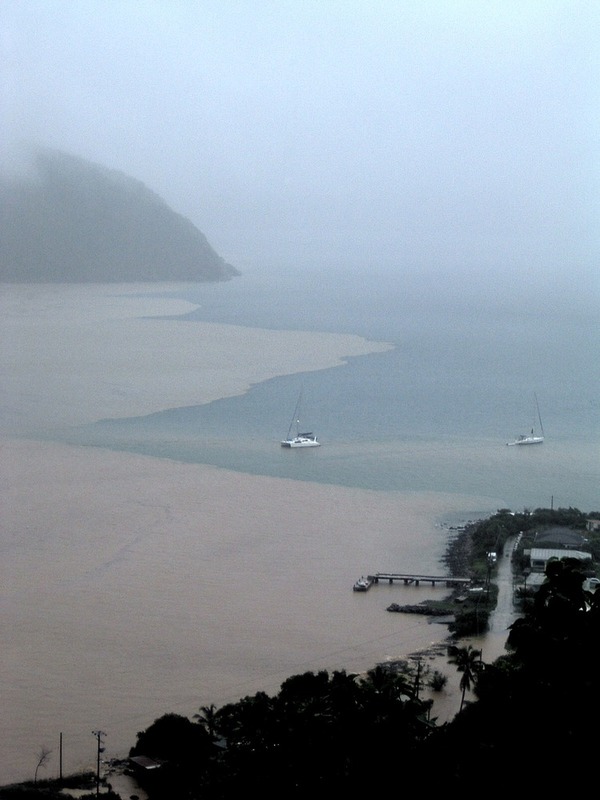 In November of 2003, I was in Tortola for the Gulf and Caribbean Fisheries Institute meeting which was practically washed out by massive rains which did a lot of damage. They were described as 100-year rains (exclusive of tropical storms). This past week, Judith Towle and Jean Pierre Bacle were in the BVI working on several projects and many of their activities were washed out by massive rains, said to be the equal of the November 2003 storms. The article below from the Herald in Scotland, which also suffered from massive storms explains why we can expect a LOT more of these major storms. The INCREASING FREQUENCY of storms also suggests why construction and erosion and sediment control measures MUST be increased. Devastation on a ‘Biblical’ scale: is this a glimpse of the future for the UK? The “biblical” floods that have wreaked havoc across parts of Britain will become more common in future as global weather patterns change, forecasters warn. North-western England sank yesterday under the heaviest rainfall ever seen in Britain, with more than a foot recorded in just 24 hours at a weather station in Seathwaite, Cumbria. Hundreds of residents were evacuated as rising water laid waste to towns and farmland, and the RAF scrambled helicopters to offer aid to the worst-hit areas. The downpour has devastated the town of Cockermouth, just south of the Scottish border, where more than 200 locals have been forced to flee their homes for safety. Two rivers have burst their banks in the area, sending millions of gallons of rainwater flowing through the main streets and leaving vehicles and businesses submerged. Red Cross worker Ian Rideout said large numbers of people were suffering from shock, and that the centre of Cockermouth “looks like it has been completely destroyed”. “I’ve never seen anything like it,” he said. “The water has caused so much damage that many of the homes here are completely ruined. “We’ve been working non-stop and between the Red Cross and RNLI we’ve rescued in the region of 200 people from their homes. Mr Rideout led a crew from northern Scotland to tackle the flooding, aided by two boats and nine rescue vehicles. Local resident Alan Smith said the townspeople were worried by forecasts of more rain into the weekend, even though the water level was falling yesterday afternoon. At one point it reached eight feet deep in some parts of the town. He said: “It’s come down four feet from last night, but the fells are sodden and if we get any more rain, it will just come straight off and into the river and the level will rise again. The Met Office said the rainfall that was seen in north-western England over the past three days had broken historical records, and the 12.5 inches that hit Seathwaite in just 24 hours was the heaviest downfall recorded in the UK since records began in 1914. Though the latest weather conditions, described as “a historical event” by MeteoGroup forecaster Julian Mayes, could not be blamed entirely on climate change, experts have warned that such freak occurrences are likely to become normal in the years to come. Describing the flooding as being of “biblical proportions”, Mr Mayes said: “The fact that there’s eight feet of water in some places is not that surprising. Chris Bell, a forecaster at the University of East Anglia in Norwich, agreed that a direct link should not be made between the floods and global warming. “It’s probably not good practice scientifically to blame single weather events on climate change,” he said. “That being said, if the globe is indeed warming, you’re going to have more heat in the atmosphere. We know that air that is warm is able to carry more water vapour. There is certainly the potential that we could have heavy rain events more commonly in the future.”. Dr Richard Dixon, director of WWF Scotland, said the flooding underlined the need for a strong deal at the Copenhagen conference on climate change in December.